When it’s summertime, and the livin’ is easy, food festivals are just the ticket for a tasty outing. In addition to tons of delicious food, food festivals offer recipes and cooking demos. And food festivals usually provide music, arts and crafts, and fun contests. Since it’s easy to be overwhelmed, check out the websites of the food festivals beforehand and come up with a plan of what to see, taste, hear and do. Stay hydrated, wear comfortable shoes and don’t forget to wear sunscreen and a hat. 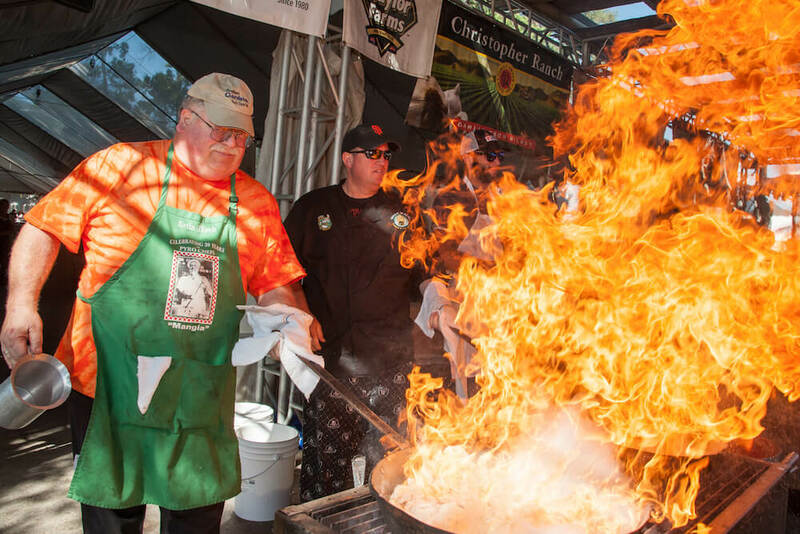 Each year, Gilroy Garlic Festival visitors consume more than 2 tons of fresh garlic from Gilroy’s Christopher Ranch. Flame-up, Gilroy Garlic Festival, Gilroy, Calif. This year’s festival, set for July 27–29 at Christmas Hill Park, celebrates 40 years of family fun. The heart of the festival is Gourmet Alley, a gigantic outdoor kitchen. Volunteers serve all the official food of the festival, while the “Pyro Chefs” put on a flame-up show preparing garlic-laced calamari and scampi in huge iron skillets. A variety of musical styles are presented on three stages. Besides cooking contests and celebrity chef appearances, the arts and crafts areas showcase a colorful variety of unique, high-quality handmade creations. Rides, games and hands-on activities are located in the children’s area. Each year over 4,000 volunteers work on behalf of over 140 nonprofit groups in Gilroy and surrounding communities. Enjoy Hope’s legendary watermelons at Fair Park, Aug. 9–11. 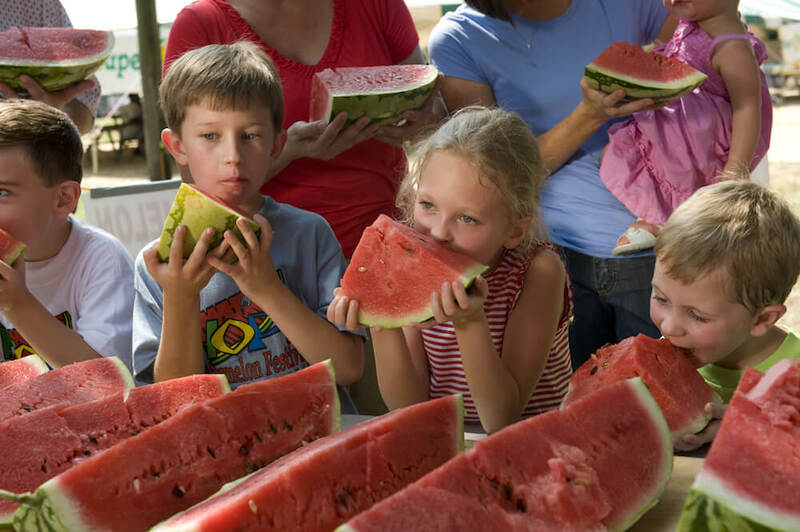 The 42nd annual Hope Watermelon Festival features more than 200 arts and crafts booths, food booths, civic club dinners, music, melon eating and seed-spitting contests, car show, 5K run/walk, Little Miss & Mister Watermelon, Watermelon Idol talent contest, dog show and a baggo tournament. New this year is the first-ever rock/paper/scissors contest. Family entertainment is scheduled for Thursday evening, with gospel singing on Friday night. Watermelons have long been associated with the city. The festival itself dates to the mid-1920s when the city staged a one-day annual festival. During these early events, citizens served ice-cold watermelon to passengers on the many trains that stopped in Hope. But those early festivals ended in the early 1930s because the city, suffering from the Depression, could not handle the large crowds. In 1977, the festivals were revived and have been held every year since. 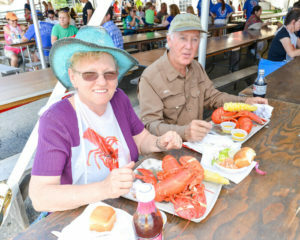 Every year during the first weekend in August, from Wednesday through Sunday, the Maine Lobster Festival offers five days of fun and feasting on the Maine coast. This year’s festival is Aug. 1–5. More than 20,000 pounds of lobster are served during the festival and more than 1,700 pounds of butter. Lobster is the star of the show, naturally, from lobster dinners to lobster wontons. There’s also steamed and fried clams, fried Maine shrimp, shrimp cocktail, steamed mussels in wine and vegetable sauce and traditional summer fair food. Festival fun includes a sea goddess coronation, a parade, entertainment, crafters and vendors, and The Great International Lobster Crate Race. Since 1947, the volunteer-run festival has given more than $500,000 to Midcoast Maine communities. Money goes to local food pantries, high school sports teams, college scholarships and community service groups. 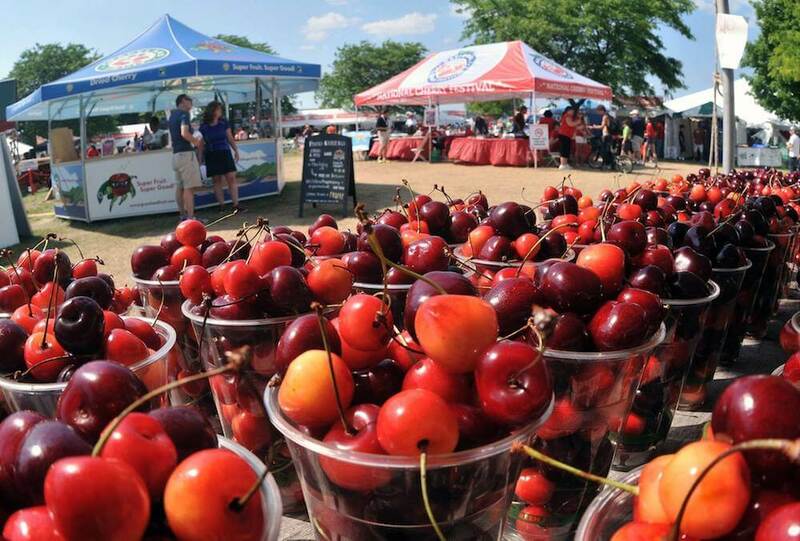 It’s all about cherries at the National Cherry Festival, Traverse City’s signature event. The 92nd festival runs from June 30 to July 7 and celebrates the power of the cherry on the shores of Grand Traverse Bay and in the heart of Traverse City. Visitors have many opportunities to taste cherries and cherry-centric products at Traverse City’s signature event. Dive into a slice of pie at the adult cherry pie eating contest. It’s also easy to head to a cherry farm and pick some cherries to take home. The festival encompasses an air show, fireworks, parades, games, midway rides and nightly outdoor concerts. 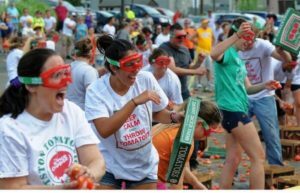 More than 50,000 people attend the annual Pittston Tomato Festival in the northeast Pennsylvania town. Tomato fight, Pittston Tomato Festival, Pittston, Pa. This year the food festival is set for Aug. 16–19. Good food, a variety of live entertainment, a parade, 5K run, games, rides, arts and crafts, bingo and of course home-grown Pittston tomatoes draw an enthusiastic crowd to the festival year after year.